If you are in any way interested in investing, the chances are that you have heard of Warren Buffett, dubbed the ‘Oracle of Omaha’ and considered to be the world’s most successful investor. 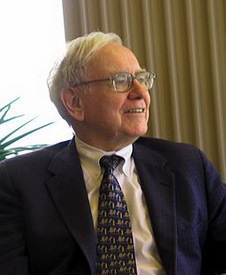 Buffett is a regular frequenter of the Forbes Billionaire’s List and is currently at number three with net worth valued at $72.7billion so it stands to reason that he is well placed to give good advice about investing. Here are three quotes from the man himself and the lessons us lesser investors can take from them! This is a warning about the very real threat of inflation on money which is not invested wisely. In the current financial landscape, bank deposits are earning almost nothing and risk being eroded by inflation. Although keeping money in the bank can feel like the safest place to park money for those who are frightened by the risks involved in investing, that is a fallacy. If inflation outperforms your savings, their real value will be going down. Other investment options are a better bet. Products such as multi-asset portfolios which spread the risk by investing in a diverse array of stocks and bonds offer protection and cater to a range of risk profiles from the highly conservative to the extremely audacious. Just like waiting for trees to reach maturity, successful investing is all about patience and time. There are of course those who invest for the quick buck, but for the majority of us slow and steady wins the race. Setting long-term financial goals and keeping focussed on them is far preferable to trying to outperform the markets in the short term. This is one reason why saving and investing is best done as early as possible, even when your time horizon is long. The more time your money is compounding and increasing in value, the better. A caution that following the herd is a definite no-no when it comes to investing. Jumping on bandwagons is a sure-fire way to miss the boat, selling underperforming stocks at a loss when they are at the bottom of the market and investing in rising stocks once the horse has bolted and they are at the top. By the time a stock is described as a must-buy in the media, the time to buy it will be well past. For most of us a ‘buy and hold’ strategy is the most effective way to build our wealth although you should regularly review your portfolio with your financial adviser to ensure that you are on track to reach your investment goals.